Michael Contegni/Staff Photographer Senior guard Marlon Beck scored six points in his final game as a Bearcat. Binghamton head coach Tommy Dempsey paced the sideline with his arms crossed and his eyes focused on the floor as he watched his team struggle in a 70-60 loss to Stony Brook. Senior guard Marlon Beck stood patiently on the court as the clock ticked down. The entire BU men’s basketball team wandered aimlessly around the court while SBU senior guard Lucas Woodhouse wrapped his arms around the ball and secured it against his stomach. 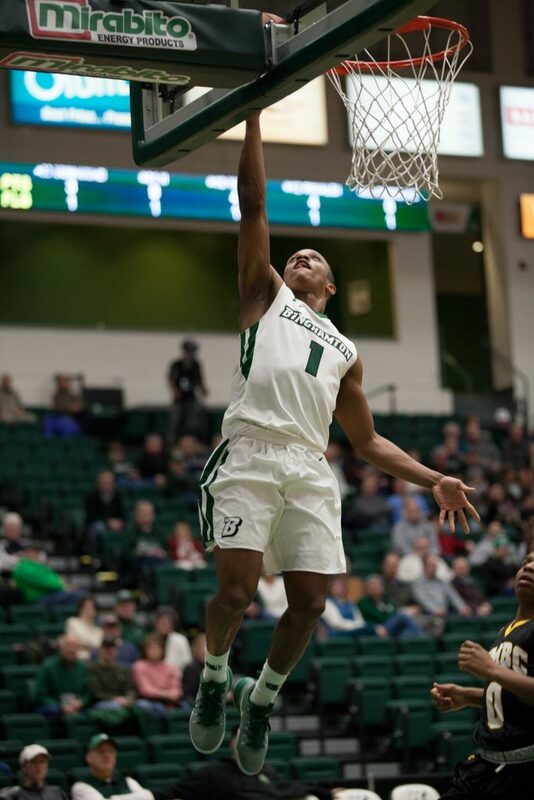 The Bearcats’ season ended on Wednesday night following a first-round loss to the Seawolves (18-12, 12-4 America East). BU (12-20, 3-13 AE) hasn’t won a game in the AE Tournament since the 2011-12 season. Against Stony Brook, Binghamton fell behind early and never recovered, as it has all season. The Bearcats’ defeat — their ninth straight — served as a bitter ending to a season that began with lofty expectations. Down by 19 points going into the second half, the Bearcats significantly cut the deficit. But toward the end of the second half, it became apparent that BU’s aggressive style of play was not enough. Binghamton recorded 15 offensive rebounds and made 33 trips to the free-throw line, trimming the lead to seven points with 41 seconds remaining. Beck finished with just six points, ending his four-year tenure as the face of Binghamton’s basketball program. He shot just one of three from the field in 17 minutes on the court. Fellow senior guard John Rinaldi was held scoreless in nine minutes. Binghamton’s guards struggled to keep pace with Stony Brook’s big, physical defense. In total, the Bearcats’ guards combined for just 17 of the team’s 60 points. None of this matched the profile of the team that began the season by going 9-6 in nonconference play. At the end of the season, Dempsey had been hoping to cite BU’s progress. But on Wednesday, the Seawolves demonstrated just how little progress Binghamton has made this year. Stony Brook’s unexpected success this season was led in part by Woodhouse and junior guard Akwasi Yeboah. Woodhouse scored 24 points in 39 minutes on the court. He was followed by Yeboah, who tallied 21 points and 16 rebounds. Junior forward Willie Rodriguez led the Bearcats with 20 points and 14 rebounds in 32 minutes. Rodriguez’s impressive performance was followed by junior forward Bobby Ahearn, who tallied 15 points and seven rebounds. The Bearcats will enter the offseason with a glimmer of hope — redshirt sophomore J.C. Show will soon be cleared to resume basketball activities. He was sidelined after undergoing season-ending surgery to repair a ruptured left tricep. Despite beating Stony Brook earlier this season, the Bearcats have struggled to perform well against the Seawolves in recent memory. BU has now lost 15 of its last 16 contest against Stony Brook. Stony Brook will move on to face No. 4 Albany on Sunday in the second semifinals of the conference tournament on Monday. Tipoff is set for 7:30 p.m. from the Island Federal Credit Union Arena in Stony Brook, New York. No. 1 Vermont will host No. 3 New Hampshire in the first matchup at 7 p.m. at the Roy L. Patrick Gymnasium in Burlington, Vermont.